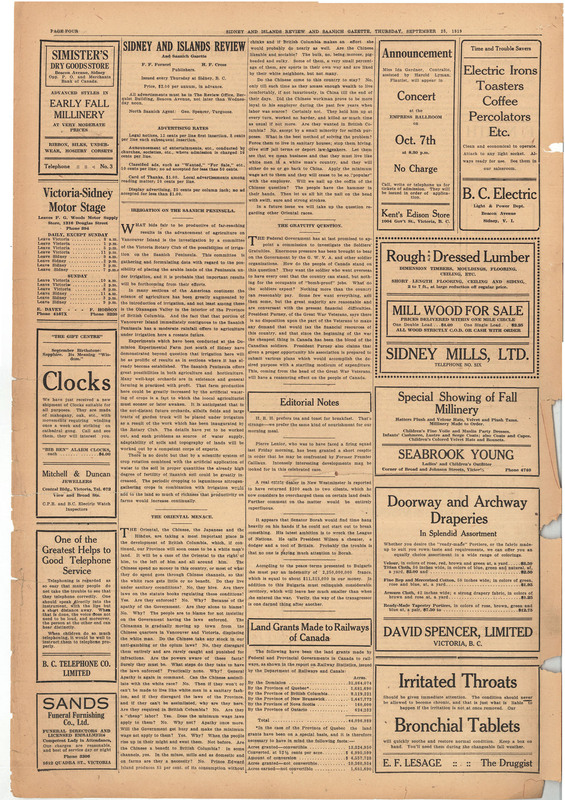 Sidney and Islands Review, "The Oriental Menace", 25 September 1919, Page 4. The Oriental, the Chinese, the Japanese and the Hindus, are taking a most important place in the development of British Columbia, which, if continued, our Province will soon cease to be a white man's land. It will be a case of the Oriental to the right of him, to the left of him and all around him. The Chinese spend no money in this country, or most of what they do spend goes through Chinese channels, so that the white race gets little or no benefit. Do they live under sanitary conditions? No, they hive. Are there laws on the statue books regulating these conditions? Yes. Are they enforced? No. Why? Because of the apathy of the Government. Are they alone to blame? No. Why? The people are to blame for not insisting on the Government having the laws enforced. The Chinaman is gradually moving up town from the Chinese quarters in Vancouver and Victoria, displacing the white man. Do the Chinese take any stock in our anti-gambling or the opium laws. No, the disregard them entirely and are rarely caught and punished for infractions. Are the powers aware of these facts? Surely they must be. What steps do they take to have the laws enforced? Practically none. Why? General Apathy is again in command. Can the Chinese assimilate with the white race? No. Then if they won't or can't be made to live like white men in a sanitary fashion, and if they disregard the laws of the Province, and if they can't be assimilated, why are they here. Are they required in British Columbia? No. Are they a "cheap" labor? Yes. Does the minimum way laws apply to them? No. Why not? Apathy once more. Will the Government get busy and make the minimum way act apply to them? Yes. Why? When the people rise up in their might and swat them. Not before. Are the Chinese a benefit to British Columbia? In some channels, yes. In the mines, mills and as domestic and on farms are they a necessity? No. Prince Edward Island produces 85 per cent of its consumption without chinks and if British Columbia makes an effort she would probably do nearly as well. Are the Chinese likeable and sociable? The bulk, no, being morose, pig-headed and sulky. Some of them, a very small percentage of them, are sports in their own way and are liked by their white neighbors, but not many. Do the Chinese come to this county to stay? No, only till such time as they amass enough wealth to live comfortably, if not luxuriously, in China till the end of their days. Did the Chinese workman prove to be more loyal to his employer during the past few years when labor was scarce? Certainly not. They held him up at every turn, worked no harder, and killed as much time as usual if not more. Are they wanted in British Columbia? No, except by a small minority for selfish purposes. What is the best method of solving the problem? Force them to live in sanitary houses; stop them hiving. Give stiff jail terms or deport law-breakers. Let them see that we mean business and that they must live like white men in a white man's country, and they will either do so or go back to China. Apply the minimum wage act to them and they will cease to be so "popular" with employer. Will we nail up the coffin of the Chinese question? The people have the hammer in their hands. Then let us all hit the nail on the head with swift, sure and strong strokes. In a future issue we will take up the question regarding other Oriental races.